I did have 3 trades go against me, but since I had legged in to each of these 3 trades, where I got out, allowed me to still have a net profit. I did make ONE tick, and with commissions, that leaves me with 53 cents. Yay profit!!! Made 5 more trades and that gained me 3.25 pts, 3 pts, 3.5 pts, 2.75 pts, 1.25 pts. That gives me in this second half of pretend trading 14 pts. That with the 16.75 pts prior gives me 30.75 pts for today's trading. I should include 1.25 pts that I actually made in real money, so that gives me 32 pts today. Started trading today @ 1 pm EST. Stopped @ 4 pm EST. Trading range in my timeframe is 1057.25 to 1065.25. That's only an 8-point range and I was able to get 32 pts (that would be with 1 contract at a time). That gives me an average of 2.25 pts (9 ticks). What have I learned today -- being relaxed really pays. My gosh, the market wasn't even really moving all that much, yet I was able to take that many points, which I haven't done in quite some time. When you're relaxed, you see and do things differently. Yes, I know that. You know that. Now, to really do that, eh? Today I only made 2 trades and they were profitable. That's great, however, I accidentally got into those 2 trades. Wasn't totally aware that I was in my funded account, but called my broker. To my dismay, I was in. My trading platform was glitching, so it took quite a few minutes to close everything down and reboot. My psychological state is pretty icky today. The ability to get really intense & uptight, it's just not there as my whole body is aching. I'm just putting entries & exits on my screen as things are happening real time. The amazing thing is, my entries are right on par for the right direction EACH time. I've been letting profits go longer than I had been in real life. Those 7 trades with 1 contract each was 16.75 pts. I currently have 2 more positions on and am on course with those. This really goes to show for me as when one is relaxed, and I am overall relaxed because I'm too sick to not be relaxed. Though, my body is distressed from being sick, I've had a lot of sleep over the past 4 days. Anyway, do what you can to relax. Don't get all stressed out about trading or making money. Though my week ended not profitably, I did trade 4 of the days and a number of trades. That is a great thing. Each day, I was able to get better with my trading, but still room for improvement. My entries could still be better as I'm getting in too late. However, I am doing a much better job being patient and using my volume indicator to assess whether I ought to be in the trade or not. I had somehow accidentally turned off my RSI and didn't even notice until a little before getting out of my last trades for the day. Yesterday I had 2 targets for the ES to the downside: 1075 and 1070.25. At the time I was thinking of those targets, it was in the 1080 range. What caused me to be negative yesterday, other than getting in a little too late, was that I had to leave my home by a certain time. Though I had an OCO (one cancels other) and one way or another I would've been taken for a profit or cost, I was unwilling to let my trade go and have my broker watch it for me. It was after 11 am EST and I set my cost stop @ 1083. It never hit it. One profit stop was at 1075 and the other at 1073. Had I just left my trades alone, I would've had some nice profits. I had gotten in at 1079.75 and 1077. That would've been a nice profit on 2 contracts. Anyway, before I left my house to meet some friends of mine that I had been looking to see for months, I closed my trade at a cost, getting out @ 1080. Wasn't a huge cost, but I figured better than if I was taken out at 1083, if that were triggered. I kept watching volume on both the 15 and 3 min. charts. 1. As price went DOWN, BEARISH volume was INCREASING. 2. As price went UP, BULLISH volume was DECREASING. 3. 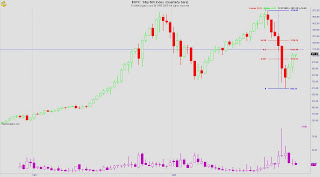 As price went UP, BULLISH volume was weaker than BEARISH volume (relative). 4. Volumes were decreasing in the 12-1:15 pm EST, compared to prior. That makes sense as traders were at lunch, but the same observations were made, just relatively smaller. All signs were still point from 1080 that the market wanted to still go lower, but at the point, it was going to test or stall at some point. To go from 1095 to 1075 and not expect at least SOME pullback was not exactly unreasonable. 38% retracement was at 1083. 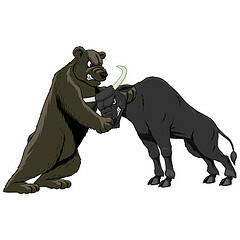 It only got to 1082.75, which meant that the market was still MORE bearish. I did not take any bullish trades and often now go more with the trend, unless the market is going sideways. The 2nd move in the ES started just before 1 pm EST and it moved 10 points down about. Top was 1082.25 and bottom was 1073. 50% retracement was about 1078. It tested this area 4 times. Anyway, what will happen Monday? It really doesn't matter to me, but if it can't break the 1078 strongly, the market will want to move, so then down it is. If it can, then it will move up. A friend said to me told by someone that was an instructor or mentor or something like that said that the problems in her trading were the same as the problems in her life. Wow, that is profound and hit me like a ton of bricks. How many bricks is in a ton? BRICKS: the average brick weighs 4.5 lbs. A ton is 2000 lbs. So, that's 444 bricks approximately. What are some parallels with my life and trading or vice versa? Here's just a quick & dirty comparison. Okay, I am listening now to an audio by VanThorpe on Disciplined Trading. My friend's mentor got this from him, I believe. Just thought this would be a good chart to show. It's always best to get a macro view of the market to see the big picture. What is happening in the market? The last candle will finish at the end of December. I do see us at least reaching 1121, which is 50% retracement from the overall highs & lows. After six quarters strongly bearish, it's just in line to let up some -- pressure relief. That's what the past 2 quarters and htis one is. 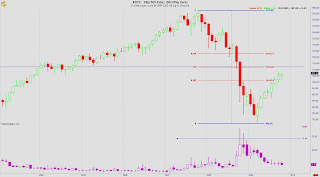 What I find interesting about the monthly chart is we've had 8 months of bullish candles. As I look back, 8 consecutive months is the most months in the past 25 years (since '84) before it is broken by a bearish month. By bearish month, I mean the closing price is less than the opening price for the month. October is the 8th month. What will November hold? I do see us from a pattern standpoint for the market to hit 1121 at some time. What I find interesting is that though price is climbing, the $VIX for the prior 3 months prior to October has been doji's. Volatility is NOT going down as price is going up. What does that say to me? Traders don't really believe price action will continue too much further up. Truly to go from 666 to 1071 is over a 400 point move on the $SPX. On 1 contract of the $SPX in futures, that's a $20,000 profit if you traded December 2009 contracts. Wow, amazing, isn't it? I really don't know what the liquidity of trading contracts that are 9 months out. My gosh. Okay, I just went 9 months out from where we are now, which we are in Dec'09 contracts to Sep'10 contracts. There is basically NO LIQUIDITY there. Even 6 months out, there isn't good liquidity. There isn't even enough data in either 6 or 9 months out to even have a real price action chart. The next contract out from Dec'09 is Mar'10. The daily liquidity is averaging 1.82M. This is more tradable on a daily basis, but certainly trading fast may not be real good. I don't really know as I haven't even done it in practice. This is after the fact and after hours. Actually, as I'm looking at the volumes on the various contract expirations on the ES, I'm really not quite sure what I'm looking at. Sorry. Today I decided to show my beau a little about how I trade. It's always interesting to see other people respond and how they take things in or not. Not sure if he was all that interested, except that it was making money. He is an avid learner, so I would think the possibility of making money while having freedom with your time is appealing. However, as you know regarding my case, trading is not a piece of cake. The technicals of it can be fairly easy, but the psychological part a challenge. 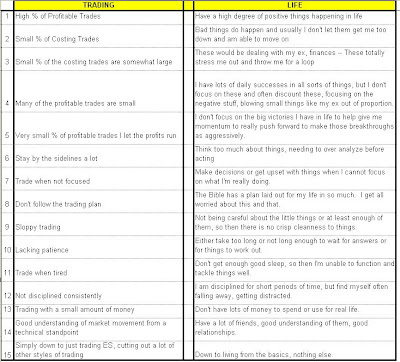 Today I only practice traded and yes, one is typically always more relaxed doing that than funded trading. I found explaining my trades and positioning was easy. Having my beau snuggle with me as I explained on my laptop (not with my huge monitor) sure put me in a way more relaxed state. Even when 2 of my trades started to seem to go against me quickly, I had my conditions set to get out if it did and the rationale behind it. The orders were in to take profits, but also in if the positions went to a point of no return - that would be an OCO (order cancels order). It was good for him to see the position go against me for a little bit and then go in my favor. I had the opportunity to tell him what the market was doing. In the case, I was in LONG and shortly afterwards, it went SHORT. The overall trend of my indicators showed bullishness and so I drew a trendline and as long as it didn't close below this trendline, I kept in the trade. It came to touch the trendline and then resume back up to eventually take me out of my trade. As it came back down to touch the trendline, that would've been a perfect opportunity to get back in again, but I was already in for 2 positions and did not want to increase my risk, just in case I was wrong. Trading seemed relatively easy with him snuggling with me and lavishing love on me. Gosh, is this what it's going to take for me to be profitable? I'm going to have him come over every morning and help relax me so I can trade well, make the money I can, and then we can work as a team to accomplish his and my financial goals. Maybe I can form a new style of trading? Snuggle trading? LOL.